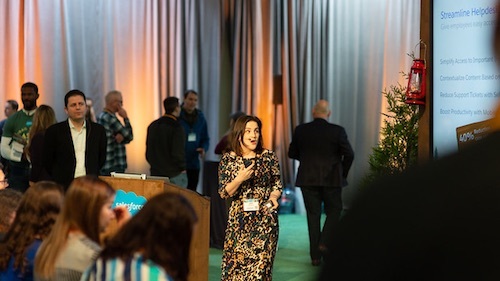 The Salesforce Spring ‘16 release is quickly approaching and soon you'll be able to take advantage of exciting new features and functionality! 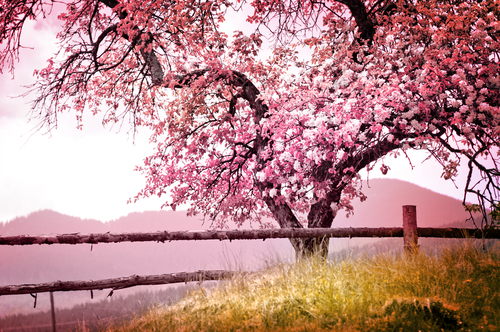 If you are a Sandbox customer, you have the opportunity to get early access to Spring ‘16 in your Sandbox and test new customizations and features before your production organization is upgraded. The Sandbox Preview window for Spring ‘16 is scheduled to begin January 8, 2016. 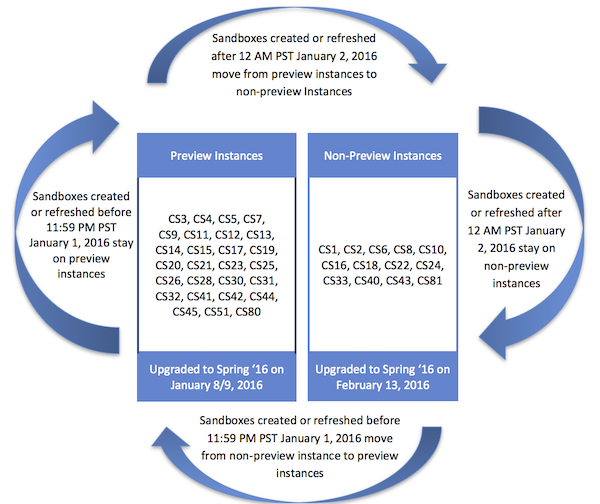 If you would like your Sandbox organization to take part in the Spring ‘16 Preview, your Sandbox must be active on a preview instance by January 8, 2016 to take part in an overall instance upgrade. From the time your Production Instance (e.g. NA2, EU1, AP0) was upgraded, all Sandbox creation and refresh requests will be routed to a Sandbox instance that will be upgraded for the preview. We will continue to route these requests to Preview Sandbox Instances until January 1, 2016. Starting January 2, 2016, all creation and refresh requests will be routed to non-preview instances until your production instance is upgraded to Spring ‘16. You have from now until January 1, 2016 to decide if you would like your Sandbox to take part in the Spring ‘16 Preview. Follow the steps below for each Sandbox org that you have. If you are refreshing onto a preview instance, do not refresh after you activate the Sandbox on your preview instance. If you do, you will be refreshed to a non-preview instance. 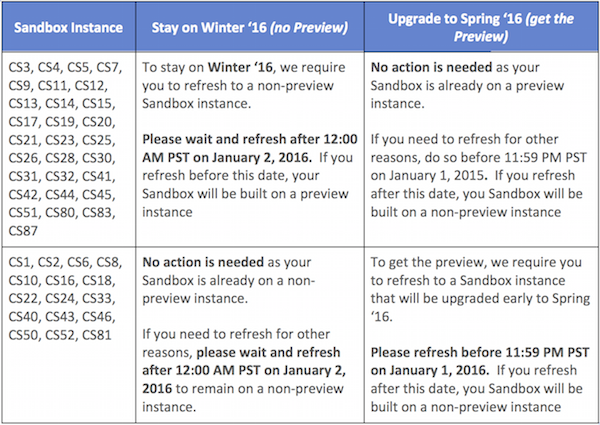 Between January 2, 2016 and the date in which your production org is upgraded to Spring ‘16, all Sandbox refreshes will be directed to non-preview instances. We cannot perform a refresh to a preview instance between those dates. 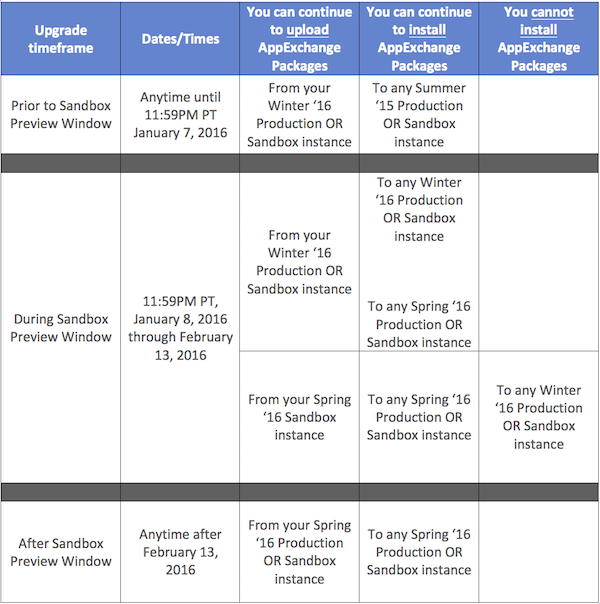 If you decide to stay on the current Winter ‘16 release, your Sandbox will not be upgraded to Spring ‘16 until February 13, 2016. The January 1, 2016 deadline is to cut off requests in an attempt to make sure that all preview requests can be met. 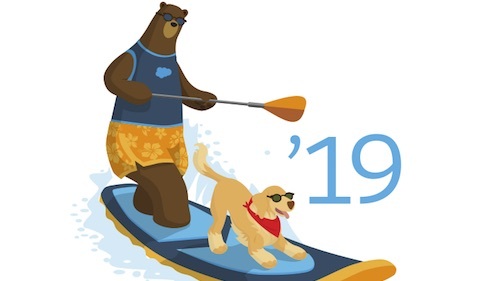 Due to the number of requests, we cannot guarantee that a request to create or refresh before the deadline will result in a sandbox org on a preview instance. The sandbox copy must complete (pending activation or activated) before the overall instance upgrade starting on January 8th, 2016. If there are too many requests or if you have a large full sandbox and did not plan ahead, the request you made may not be processed by the time of the upgrade. If you have a large full sandbox, please keep in mind how much time it takes to complete your Sandbox refresh to ensure your copy is completed by January 8, 2016. If the sandbox copy does not complete by the upgrade on January 8th, the copy will be restarted to a sandbox instance that remains on the same version as your production instance. Plan Ahead! - You may need to request your refresh in advance of the January 1, 2016 deadline to ensure it completes by January 8, 2016. 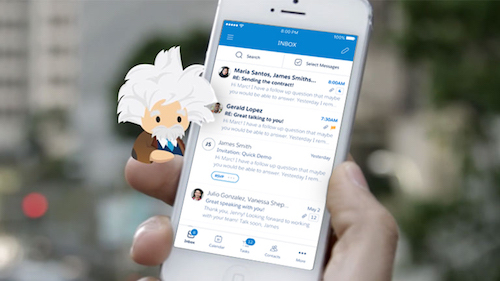 If you have additional questions about your Sandbox options in conjunction with the Spring ‘16 release, please contact salesforce.com Customer Support. In addition to the steps above, use the following graphic to understand what will happen to your Sandbox if you request a new sandbox or refresh an existing sandbox. For example, if your Sandbox is on CS12 and you refresh it after 12 AM PST on January 2, 2016, it will be moved to a non-preview Instance.